The iCLASS Key provides the security and convenience of iCLASS 13.56 Mhz contactless smart card technology in a molded plastic key fob that is durable in harsh environments. This credential can be placed on a key ring or lanyard for access control applications that do not require a Photo ID. The ISOProx II Card offers proximity technology with photo identification capability on a single card. It is ISO 7810 compliant, with a nominal thickness of .030". The card features a graphics quality surface optimized for Photo ID printing, and is available in standard PVC construction, or a composite polyester/PVC construction for more demanding high wear and tear environments. 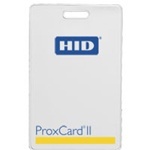 DuoProx II multiple technology proximity card offers proximity, magnetic stripe and photo identification technologies on a single access control card. DuoProx II card is ISO 7810 compliant, with a nominal thickness of .030". It features a graphics quality surface optimized for Photo ID printing. The ProxKey II is a proximity keyfob offering HID proximity technology in a convenient, pocket size device. 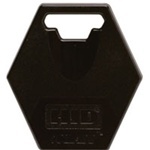 It easily attaches to a key ring, badge clip or lanyard. The ProxKey II is built to withstand harsh operating environments or handling. 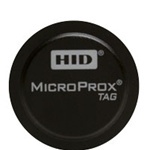 The MicroProx Tag provides the convenience of HID's proximity technology in a small disk-shaped transponder. Simply attach the adhesive-backed Tag to any nonmetallic card or device, and you instantly have a proximity card. 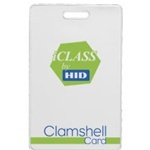 HID's iCLASS Clamshell card provides 13.56 MHz read/write contactless smart card technology in a cost effective card package, with an ABS shell construction that provides durability in harsh environments. iCLASS provides enhanced security through encryption and mutual authentication while delivering the convenience, affordability and reliability of proximity technology for which HID is known worldwide.